Songs for baritone and piano (1914-1921): When Icicles Hang by the Wall (Shakespeare); Take O Take Those Lips Away (Shakespeare); Sorrow Song (Samuel Daniel); The Message (Donne); Farewell (Bishop Reginald Heber); Care-Charmer Sleep (Samuel Daniel); Since Love is Dead (Frederick G Bowles); The Soul of Steel (C M Masterman); Why Dost Thou Wound and Break My Heart? (Herrick); On Parting (Temple Keble); Lady Ellayne (Temple Keble); Renunciation (Temple Keble); Love is a Merry Game (Temple Keble); Piping Down the Valleys Wild (Blake); The Chimney Sweeper (Blake); The Land of Dreams (Blake); The Defiled Sanctuary (Blake). Only recently I was commenting on the disorientation of meeting a composer, known for tackling the symphony, writing art songs (Martinů songs) Here is a similar experience except that I knew what was coming having heard these recordings when they were first issued on LP all of 25 years ago. Havergal Brian famously wrote 32 symphonies during his long life. There are in addition operas, concertos and much else but that he wrote songs will come as a surprise to many. The first of the two Shakespeare Songs has a brutal fortissimo joyousness about it. It is memorable for its buffeting melisma on the word �blow� and for an idiom recalling Finzi in his most forthright and dissonant moments. Speaking of Finzi the tolling concentrated mood if not the manner of Since Love is Dead reminded me of Finzi�s He Abjures Love. Take O Take Those Lips Away protests as strongly as the Foulds songs The Phantom Horseman and The Seven Ages of Man. Sorrow Song recalls the stalwart baritonal sections of Omar Khayyam written by Brian�s friend Granville Bantock. In fact the BBC broadcast through which I know Bantock�s Omar has the same baritone as one of the trio of soloists. The Message gets as close as Brian ever gets to the troubadour-like cavatina of songsters such as Mary Plumstead, Gurney�s Hawk and Buckle and the least complicated songs of Peter Warlock - all territory well-known to this baritone. Farewell is notable for its grand Brahms-influenced piano part and that same leonine rearing upwards can also be heard in the Herrick setting Why Dost Thou Wound and Break My Heart? Care Charmer Sleep with its free use of dissonance was written during 1919 while Brian was deeply enamoured of Elizabethan poetry. When Icicles Hang by the Wall foreshadows the protesting fulminations of The Soul of Steel. Defiance is very much the tenor of another collection of songs recently issued: the BMS collection of the songs of another of Brian�s friends, Rutland Boughton (to be reviewed). On Parting and Ellayne recall the songs of Cyril Scott. The mystical Renunciation again suggests Scott and Debussy. It contrasts nicely with the by turns gaunt and jaunty Love is a Merry Game - a mercurial song constantly changing in mood and fascinating throughout. Both Piping Down the Valleys Wild and The Chimney Sweeper sound rather like very early Britten folk settings - artful and carefree. After two Blake ballads come two very different Blake settings. The Land of Dreams and The Defiled Sanctuary are a different proposition altogether - expressionist in style, chilly, desolate, despairing and lichen-hung reaching its apex in The Defiled Sanctuary. This protesting music is related again to Sorrow Song and its forebear in Bantock�s Omar Khayyam at the words: "A Muezzin from the Tower of Darkness cries / "Fools! your Reward is neither Here nor There!"" .... and ... "Up from Earth's Centre through the Seventh Gate / I rose, and on the Throne of Saturn sate ...." The slatey darkness of Rayner Cook�s voice is a perfect complement to the black and bleak defiance of the words and music. With thematic relationships to The Gothic and the Violin Concerto, the Legend lies at first in a land remote from the piano-violin Legends of Bax and Delius. However after the preface of determined and angular writing the music veers into lyrical territory. The violin�s singing solo statements also mark out similar moments early in the first movements of not only The Gothic but also the Third Symphony. Brian�s lyricism can be rather chaste in Legend and some of it evokes a taciturn Lark Ascending. The piece ends in a passive gesture - sounding almost unfinished. The performance is full of vitality although as with its original vinyl release the sound is slightly boxy. Legend is the only surviving chamber work by Havergal Brian. The sound in the songs is big and unapologetic. The notes are exemplary as you would expect from one of the two leading Brian scholars, Malcolm Macdonald. The texts are printed in full. The songs are all well-rounded, well recorded and project a grand nobility aided invaluably by Brian Rayner Cook�s distinctive baritone and the sensitive and, when called for, larger than life pianism of Roger Vignoles. This disc will be widely welcomed. 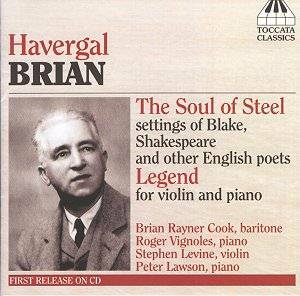 The release on CD of these outstanding performances of intriguing and impressive music should find ready takers in the burgeoning market for British song and for the music of Havergal Brian.